Frontiers Records is pleased to announce the release of the Self-Titled debut album from the US band ACTION on December 7th 2007 ! Oiginally formed in 1985, Action is a long-time concept devised by acclaimed guitarist / songwriter Chip of What Matters, Mars Hill and The Hitmen. The band also features the soaring vocals of other former Mars Hill member Jack Marques (Crossover, Unknown God) and the musical talents of bassist Chris Sutherland, keyboardist Ruben Demello (Crossover, Unknown God), drummer Chris Longo (Project Broken, Dirty Deeds, Hysteria, Promises) with additional drums from Mark Duane (Trendkill, Paradox, Action, Touch, Krankenstein). As founder and guitarist for the band Action during the mid to late 80’s, Chip shared the stage with Quiet Riot, Firehouse, Slaughter, Rough Cutt and Zebra among many others. As the musical landscape quickly changed in the early 90’s, Action split not to be heard from again until he collaborated with singer / songwriter Jack Marques a decade later. Between bands and life itself, both Chip and Jack had each individually written and recorded a number of outstanding melodic rock tracks over the years which ranged from 80’s rock / metal to more modern adult oriented rock. Each had always been saving these unused gems for some future project; they just weren’t sure what it would be. What is certain, these gems are fresh, melodic power rock – true to its 80’s roots while delivering a modern kick! Action is an infusion of Boston meets Journey with touches of Whitesnake and Def Leppard. With this mix, Action delivers what rock f ans have been waiting a decade or more for – screaming melodic guitars, soaring vocals, catchy choruses and rockin’ beats. Never feeling that Action was quite finished, in mid 2006, Chip approached friend and manager Ron Vining about getting the project off the ground again. 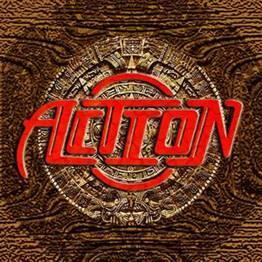 In February 2007, Action were snapped up by Frontiers Records and the album was delivered a few months later, with an artwork courtesy of Richard Mace (Journey, Soul SirkUS, Jeff Scott Soto). Album tracklisting will include the following songs: Without Your Love; Someday; Here In My Heart; Destiny; Forever; Loveless; Don’t Leave Me Lonely; Heaven Tonight; Cinderella; Feel The Fire; Is It Love. The wait is over. Get ready, Dece mber 7th 2007 is the date when European (on Frontiers Records) and Japanese (on King Records) Melodic Rock fans across the globe are going to get a whole lot of Action!